Lauren Meale, is the gorgeous gal behind the super successful and motivating insta page @nourishing.loz ! This is one of the first food grams I ever followed and I still get so much motivation from it everyday! It's super cool, so if you don't follow already - definitely go do that NOW!! Lauren is such a beautiful soul and is so real and down to earth, she's definitely not afraid to let you know she stayed in bed that morning or stayed out late hehe .. which I absolutely love and I really admire how authentic she is! Enjoy reading through her interview lovelies! I am 20 years old, I study finance and commercial law at Victoria University in Wellington but am originally from Auckland. I am a hard worker, bit of a perfectionist and I really like coffee. I have been active all my life, as a kid this was mostly team sports. These days I like to train at Les Mills, (either classes, by myself or with a PT), or push myself on a long run. I am obsessed with the feeling of knowing you are stronger/faster/fitter than you were yesterday. I love experimenting in the kitchen and eating well. I am passionate about inspiring other young women to be the best versions of themselves by fuelling their bodies, keeping active and being positive and confident. When I think of health, I like to think holistically. Its great to be physically healthy but if this is taken too far, or negatively affecting your mental/emotional health, then you aren’t truly ‘healthy.’ Too often I see young girls developing eating disorders, suffering from hormonal imbalance, or malnourished and lacking certain nutrients (e.g. Iron, B12) from overly restrictive diets. Its great to eat well and feel good, but if going out for ice cream gives you anxiety then it might be time to take a step back and reevaluate. I like to stay healthy by nourishing my body and soul. I love smoothies, salads and moving my body every day; but I also love taking time to chill out, catch up with friends and do the little things that make you truly happy. Relaxation is so undervalued! A stressed body is never a healthy one. While uni can be pretty full on, in a lot of ways the student life is super flexible and I am so thankful for that! Three days a week I have 8am lectures, this suits me just fine as I am a morning person anyway! I typically spend the morning at uni, studying, going to lectures and tutorials, then manage to get back to my flat for lunch. I will then do some chores, finish off any uni work that needs doing and head back out, either for a run or to the gym. I like to get home not long after dark, make a big nourishing dinner and settle in for the night with tea and either a good book, Netflix or any assignments. Like I said, every day is different! Some days I workout in the morning and might not even have to go to uni at all. I have a lot of meetings to fit in each week and prioritize catching up with friends as well. 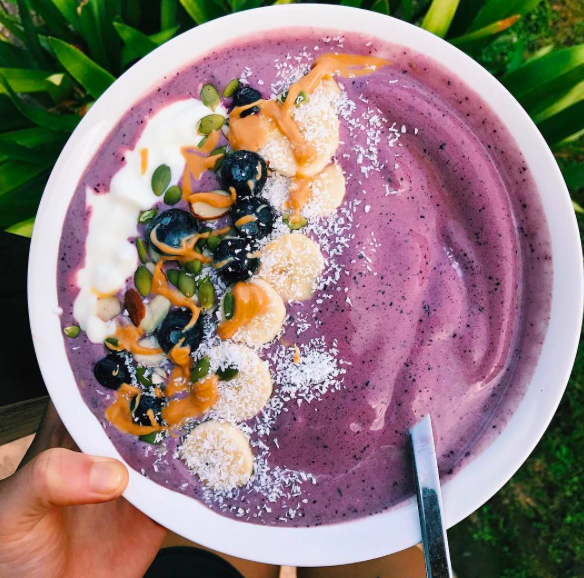 My go to breakfast (when its not too cold) is a big smoothie bowl with muesli. I make sure I add both a source of fat and protein to make sure I have sustained energy throughout the morning. Mid-morning I will usually grab a coffee somewhere close to uni. I like to mix up my order but love a good soy latte. If I make it home for lunch then hopefully I’ve got some leftover roast vegetables that I can turn into a salad with some pesto and poached eggs. Avocado and eggs on toast is another one of my go-to’s! I like to snack on bliss balls, fruit, nuts, yogurt and make sure I am fuelled before my workout! I’m pretty bad at late night snacking and will usually have some dark chocolate or nut butter with a few cups of tea. I think the most important thing you can do is learning to listen to your body. It takes practice for sure, but I feel like these days I am totally in tune with what my body wants. When you work with it rather than against it, that’s when you really feel great and make progress. I can tell when my body is craving some red meat, when it needs to rest, when it wants to run, when it wants a big bowl of fruit and I am so thankful to finally be in tune with these cues. I think I’m quite lucky that outwardly, I’m not a huge stressor. I put a lot of pressure on myself to do well but at the same time I’m quite strategic about what I will get worked up about/put a lot of hours into. I am definitely all for taking time out each day to do whatever makes you feel good, whether that’s running, yoga, netfilx, reading etc. Recharging is super important! About three years ago I was incredibly underweight, malnourished and unwell from taking ‘healthy’ way too far. The hardest part of my wellness journey has definitely been recovering from that dark place and finding myself again. Honestly I think the worse feeling in the world is getting a result and knowing you could have done better. It doesn’t matter if it’s a grade or a running time. If you’ve put your heart and soul into it you won’t care that it’s a C or that you came 112th. Kumara, avocado and peanut butter! Definitely depends on how I’m feeling! Probably either a long run or GRIT strength but some days a walk or yoga class serves me better. Life is for living – eat the damn cake, stay out til 4am, make mistakes, and put your heart and soul in to whatever makes you feel alive. Thanks so much Lauren for being apart of "IN HER SNEAKERS" and thanks for being such an inspiration! !